A group on Ravelry has inspired me to join a Blog Hop. The focus is a 30 day challenge to finish a WIP and I only have 23 days left as you can see by the countdown on the right. I have so many projects to choose from since I constantly come down with a serious case of startitis. It seems that at least once a week, I decide to start something new. I’ll work on it for 3 or 4 days straight and then I put it aside and return to another knitting or sewing project. I wish I was a little more focused so that things were completed in a shorter period of time but this seems to be my process so I don’t fight it. Here’s the project that I’m trying to finish for the Blog Hop. This is actually a new project. I left my job at the end of June to pursue Knit n Sew Studio on a full time basis and this yarn and pattern were a gift from a group that I worked with for many years. They actually gave me a gift certificate to one of my local yarn stores. I was able to purchase the pattern, yarn, and even new Knitter’s Pride Dreamz needles. The picture on the pattern doesn’t do the sweater justice. 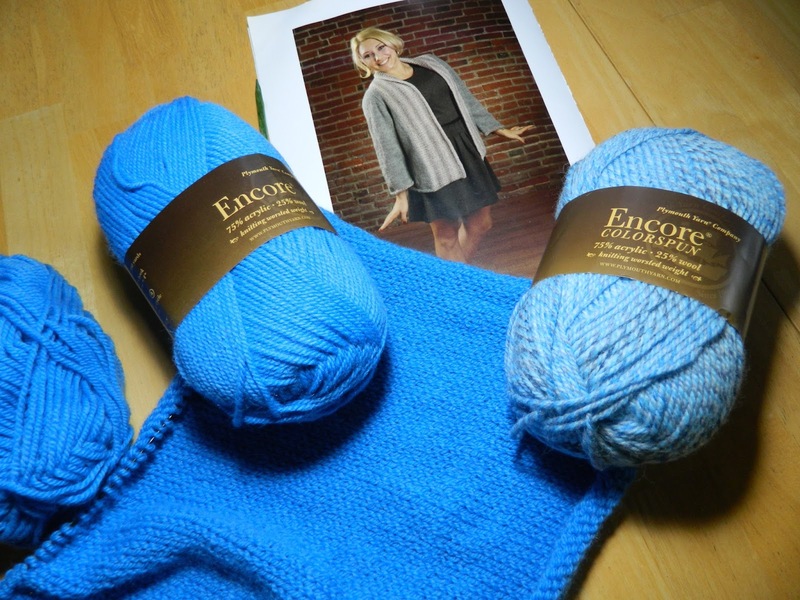 The pattern is by Plymouth Yarn #2555 , the yarn is Plymouth Encore in a lovely blue with a blue tweed for the trim. Luckily there was a sample at the store or I would have walked right past this pattern. As you can tell, I’m only about halfway done knitting the back of the sweater so completing it is going to be quite a challenge. I really want to wear it this Fall so I’m hoping that the 2 incentives will have it finished within the month. I also have several socks that have been sitting on the needles since last year and I’m going to try to finish at least two.